Ex Super Eagles Goalkeeper Vincent Enyeama Full Biography,Life And News. Vincent is a Nigerian professional footballer who plays for French club Lille as a goalkeeper. He was also a member of the Nigerian national team from 2002 until October 2015, serving as its captain from 2013 until his retirement from international football. He is his nation’s most capped player of all time, ending his international career with 101 caps. Vincent Enyeama is a goalkeeper at OSC Lille. He was born in Kaduna (Nigeria). His professional career started in 1999 when he joined Ibom Stars for which he played in 56 matches. In 2001 the player caught the eye of the local football club Enyimba and resolved to acquire a young goalkeeper. He represented the new club over a period of three years and was an effective element of the team. In three years he featured in 100 games and netted 10 goals. He is one of the few goalkeepers in the world with goal scoring abilities. Since 2002, he has played for the national team of Nigeria. He plays club football for Hapoel Tel Aviv Enyeama was selected for the 2002 World Cup as a cover for Ike Shorunmu. He only played one match in that tournament, but has since taken over the spot after Shorunmu’s international retirement. Since then he has been the first-choice goalkeeper for the national team, playing in the 2004 African Cup of Nations and 2006 African Cup of Nations. Enyeama played for four seasons for Enyimba in Nigeria, and helped them win the CAF Champions League in 2003 and 2004. After three seasons with Enyimba International F.C. and one with Iwuanyanwu Nationale (now known as Heartland F.C. ), Enyeama moved to a minor club in Israel, Bnei Yehuda Tel Aviv. He had a fantastic first season, showing amazing physical and athletic skills. In his first season with Bnei Yehuda, the team qualified for the final of the Israel State Cup and achieved fourth place in the Israeli Premier League, which qualified the team for the 2006 UEFA Cup. Enyeama signed for Hapoel Tel Aviv in 2007. Hapoel Tel Aviv endured a poor season in 2007/2008, but Enyeama helped the team to avoid relegation and reach the state cup final. During 2008/09 Hapoel, unexpectedly, almost won the league title, with Enyeama winning the “Player of The Year” award – although he is a goalkeeper, and although he wasn’t playing at the team who won the championship. During that year Enyeama became Hapoel’s penalty kicker. In 2009/10 Hapoel won the Double, with Enyeama scoring an advantage goal during the Cup Final, and missing a penalty on the last fixture of the year, where Hapoel eventually managed to score a winning goal on the 92nd minute and win the league. On 18 August 2010 he scored his first goal of the 2010–11 season with a penalty against Red Bull Salzburg in the Champions League qualifiers. During that season Enyeama played well on the Champions League Group Stage with Hapoel, claiming great grades from the press during a game against Lyon and against Schalke 04. At this year Enyeama won the Israeli cup once again. In August 2012 Enyeama agreed a one-year loan deal with Maccabi Tel Aviv and was presented to the media by Maccabi’s Sports Director Jordi Cruyff at 8 August 2012. At that season he captured 27 appearances in the Israeli Premier League and took part in Maccabi’s success to win the championship title. During the 2013–14 Ligue 1 season, club manager René Girard picked Enyeama as his first-choice goalkeeper ahead of Steeve Elana, who had been the first-choice goalkeeper when Rudi Garcia was the club manager. With the help of his two centre-backs, Marko Baša and Simon Kjær, Enyeama kept 11 consecutive clean sheets in Ligue 1 matches during the first half of the season. On 8 December 2013, Enyeama finally conceded a goal after playing 1,062 minutes of Ligue 1 football in an away match against Bordeaux, during which he was beaten by Landry N’Guémo’s deflected strike in the 27th minute. He thus came within 114 minutes of equalling Gaëtan Huard’s Ligue 1 goalkeeping record, set in 1993, of playing 1,176 minutes without conceding a goal. Enyeama made his second FIFA World Cup participation in the 2010 tournament in South Africa. In Nigeria’s opening match, he was named man of the match, producing a defiant display to restrict Argentina to a 1–0 win. Enyeama, who was playing his 56th international for the Super Eagles, made six fine saves against the two-time world champions, four of them from Lionel Messi. Argentine coach Diego Maradona praised him as the reason Messi was not able to score a goal. Enyeama was also awarded man of the match in the team’s next fixture, a 2–1 loss to Greece, but was at fault for Vasilis Torosidis’ winning goal. At the 2013 Africa Cup of Nations, Enyeama deputised for regular captain Joseph Yobo, who stayed on the bench for most of the competition. On 10 February, Enyeama led Nigeria to its third continental victory, keeping a clean sheet in a 1–0 defeat of Burkina Faso in the 2013 Africa Cup of Nations Final. He was named to the team of the tournament as first choice goalkeeper, conceding only four goals in six matches. 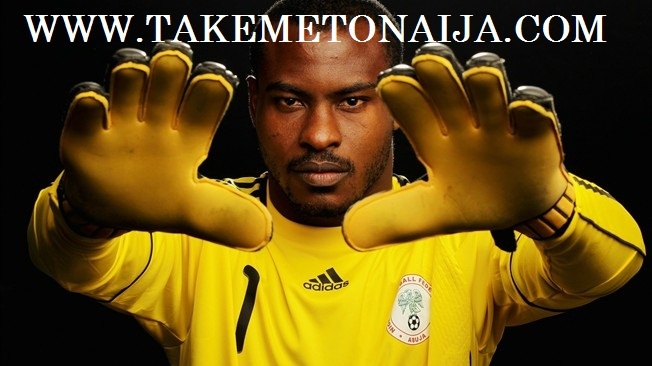 In June 2014, Enyeama was named in Nigeria’s squad for the 2014 FIFA World Cup. In the Super Eagles’ first fixture, he kept the second FIFA World Cup clean sheet of his career as the team drew 0–0 with Iran. He subsequently recorded a second consecutive shutout in the fixture against Bosnia and Herzegovina, a 1–0 win which gave Nigeria its first win at the tournament since the 1998 edition. He conceded three goals in the last match of the first round against Argentina, a game which ended in a 3–2 defeat for Nigeria, placing them second in the group and thus qualifying them for the second round for the first time in 16 years. On 26 March 2015, Enyeama won his 100th cap for Nigeria in a 1–0 loss to Uganda. He retired from international football on 8 October 2015. Congo and Cameroon. He then decided to quit Super Eagles. course, I have kept the faith and sang the anthem with passion. of my life but I know that Nigerian are there for me and God is with me. WHAT DO YOU THINK OF VINCENT’S CAREER AND RETIREMENT? DROP YOUR COMMENTS.